"Memphis said the words without feeling. He wasn't thinking of being grateful for supper, but of the bounty he hoped to receive for himself. He prayed for his place in the world: his own words in a book and a reading at a salon on Striver's Row, a place at the table with Whitman and Cullen and Mr. Hughes." Imagine you’re a jive New Yorker during the 20’s—jazz rules; there are speakeasies around every corner, an abundance of bootlegged liquor and flapper girls dancing the night away. To enjoy it, all you’ve gotta do is go undercover and hope the cops don’t bust in on the party. Evie O’Neill is one hip gal who desperately wants to be in the thick of it all. She finally lands her chance when her uptight parents ship her off to the big city after an ill-performed party trick. Evie moves in with her Uncle Will, curator of the aptly named “Museum of Creepy Crawlies,” and is having the time of her life until a series of grisly murders threatens to ruin her good time. With the help of “Unc,” some sweet soothsaying abilities and a few talented friends, Evie’s embarks on a serious mission to figure out whodunit; because if the New York nightlife doesn’t get to her first, there’s a good chance the killer will! This was my introductory into the world of Libba Bray, and my friends, I’m quite pleased! The Diviners is gripping, suspenseful and memorable without being too over-the-top. There’s soooooo much potential, and let me just tell you, the book lives up to it 110%! After reading, it’s very apparent Bray’s done her research well—from the diction to the fashion and politics, I was completely immersed in the glamorousness that is the Roaring 20’s. I guess the only downer is that, well; all the research makes the book quite thick. Occasionally, the text verges on meticulous leaving it feeling more like an encyclopedia entry than a story. But worry not because it doesn’t happen often and Bray’s affinity for vivid storytelling trumps all. There’s so much going on that the murders sort of meld into the background and feel more like an afterthought, which is okay because it’s a story more about people and their inner demons than anything else. The characters are what made me fall hard and is where the strength of Bray’s writing lies. She just totally baited me—hook, line and sinker. First off, can I just say how much I want Evie to be my BFF. Forget Mable, it’s all about the Nikk-ski. See what I did there? We’re meant to be! Not only is she a total doll but she’s a firecracker to boot. Evie isn’t afraid to get her hands dirty at a crime scene or put a fast-talking reporter in his place. She’s got moxie, spirit and gusto, but as feisty as she is, she’s just as loyal and dedicated to those whom she calls a friend. She’s certainly not perfect and she gets herself into trouble but she’s candid and remains true to her convictions. How could you not love someone like that? Then there’s the lovable thief, Sam Lloyd. He fights hard to worm his way into Evie’s heart and it’s hard to tell whether he’s being serious or pulling the wool over our eyes. Either way, he plays a dangerous game and has won my heart over. We also have Jericho, Will’s smarty-pants assistant and the apple of Mabel’s eye. I’m intrigued to see just how far Bray will take the interesting twist in his storyline. Bray rounds it out with Theta, a vivacious vixen who comes from humble beginnings. She is the embodiment of 20’s excess and is a girl after my own heart. There’s also Henry, Theta’s gay brother-from-another-mother who’s a whiz at the piano and her lover, Memphis. Oh, sweet Memphis with the charming smile and poetic wordsmithery (is that even a real word?). Memphis has a soulful sadness about him, what I like to call, the melancholy blues. His unwavering devotion to his brother and beautiful way with words are simply irresistible. Bray’s diverse cast of characters is bold and I applaud her for that because it’s not something you see very often in YA. All of our players harbour these immensely tragic backgrounds and unbeknownst to everyone else, life-altering secrets. I can’t wait to see how their individual stories intersect and play out in future installments. 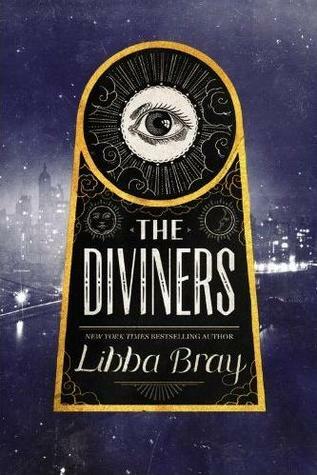 Overall, The Diviners was an utter joy to read and if I had to describe it in one word, it’s divine. Libba’s on the fast-track to becoming a favourite author of mine, so yeah, what an introduction indeed! 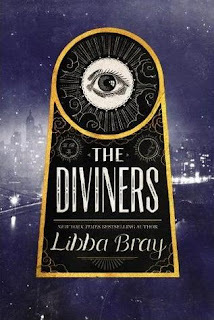 The Diviners is a chilling paranormal tale that’s as authentic and genuine as its beautifully imperfect characters. Though a bit heavy on text, it’s worth reading through every single word and it never feels like a chore. Bray’s world and her peeps will blow you away with how posi-tute-ly brilliant they are! And how! Thanks, Tammy! You should definitely check it out--you won't be disappointed. I am waiting desperately for this one (my library has been closed all week because of the storm and it had JUST been delivered. Hurricane Sandy is blocking my access to this read). I love this time period and feel like I never read anything set in it. Great review. Boo! It's a unique concept and I love the era in which its set--it just works. Let me know what you think once you've finished reading it! I'm intrigued to know! Your review expressed everything I loved about this book! The characters- I just want to befriend them all and go to a speakeasy with evie so much! So very very on tenterhooks to find out where ms. Bray is going to take everything in the next book. They are so amazing, aren't they? I wish I had friends like Theta, Memphis and Evie. The next book can't come out quick enough! A very late comment, but I'm going to have to buy this one now - everyone with similar tastes to me loves it and Evie sounds so awesome.